This is a tricky area, but VERY important. Unfortunately the divorce rate among the MS community is very high. Not only is the MS patient dealing with major changes in his/her own life but now he/she has to help the family along, too. Communicate these points to all your loved ones… family AND friends, too. Get the whole family educated about MS… the best way to see there’s no monster under the bed, is to LOOK for yourself! Let them know that just because you LOOK good doesn’t mean you FEEL good. Get the kids involved in more chores. Make a game of it! Let the family know that you CAN’T do more than one major task at a time. Tell THEM to answer the phone from now on. Tell the family to let YOU decide what you’re capable of doing. It can make you feel bad if they are tip-toeing around saying, “you shouldn’t be doing this or that”. Let them know that because you did a certain activity yesterday, doesn’t mean you can do it today. Every day is different! Take it ALL one day at a time. Let the family know that life will NEVER be boring again… hooray! Please let them know that when you are angry or frustrated, it’s aimed at the disease and the changing lifestyle… NOT THEM! With some of these points made, in a gentle way, you can ALL pull together to make the family stronger! It’s easy for the family to forget these points when you “look so good”… Put points on a bulletin board or fridge! Please visit the following BIG STICK RECOMMENDED web site! 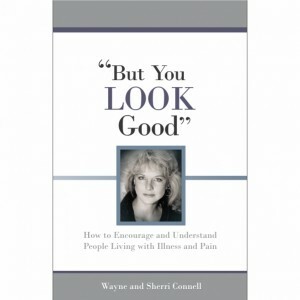 A Guide to Understanding and Encouraging People With Chronic Illness and Pain! Price INCLUDES Shipping from US to Canada!